What I Wish Society Knew About Stillbirth. A couple days ago I found this prompt on Pregnancy Loss Journey‘s Instagram account. Instantly, I was flooded with reactive thoughts, but thought I would think about it more in depth. Since then, I’ve encountered a very uncomfortable conversation that left me emotionally distraught and the fact that I’m coming up on a HUGE milestone day for Jensen. Since I knew I wanted to respond before Pregnancy and Infant Loss Awareness Month, I’ve narrowed it down to five things. Grief doesn’t magically end or subside with time. Long ago and still to this day, some person or group decided there was an appropriate length of time a person should grieve for their child or for any person. Whether this be in the short three to five day grievance time employers let employees take off or as long as one year. In the early days, I remember being told grieving will pass in a year and you’ll start to feel normal again. At least it is in my situation. I’m about a year and half out from losing my first born and I still cry almost everyday. His absence in my house is felt in the bones of my house. He is constantly missing from my day-to-day life and big family get-togethers. The grief of losing a child never ends. I will carry losing Jensen till the day I die. What I wish society would know is that it does change in time. It might seem like a person is doing better or smiling more, but that doesn’t mean they stopped grieving the loss of their child. Another child wouldn’t erase the pain from loss. Stillbirth is defined as a loss after twenty weeks gestation, in the United States. I had Jensen at thirty-eight weeks pregnant. He was full term and everything was ready for him to come home. That was his entire lifetime, just as it is for any child who was stillborn. During the time a mother (and father) has with their child, they plan and dream of years beyond the present. They don’t just see this baby as a baby, but a person who they will raise and help achieve all their dreams. When that child dies, there is so much pain from losing them now and the future they very much wanted. In the midst of this pain and realization, others outside the situation might suggest the couple or mother just have another child. This is a very complex idea for a person after pregnancy and infant loss. For starters, it’s not always ‘easy’ for people to just get pregnant. Infertility is common and there might have to be intervention to help a couple achieve pregnancy. If a person does get pregnant, there’s the stress and worry of pregnancy after loss. Everyday could feel like the last with their child. Some might lose more babies. Even if the subsequent pregnancy results in a living child, they still have lost their other baby. Another child does not erase what they have been through or make them forget about the child they hold in their heart. I monitor what I say to make those who haven’t lost comfortable. This is a hard one for me to admit. I wish society knew all that I held back in my head. There have been many times where I’ve been in an uncomfortable conversation or situation regarding pregnancy, birth, or infants that I wanted to scream or run away. Instead, I have to mentally calm myself to make sure I don’t completely break down or snap. I know, I know. The world can’t bubble wrap me from being around pregnant women and newborns, but I also can’t erase my experience and knowledge with what can go wrong. Yet, it shouldn’t be uncomfortable for me to talk about my child and time being pregnant without looks of grimace. I understand complaints about children and pregnancy are just how life is, but I am so jealous of the ignorance around them. Stillbirth has opened my eyes to how cruel the world really is and how every baby is a miracle whether they live or not. 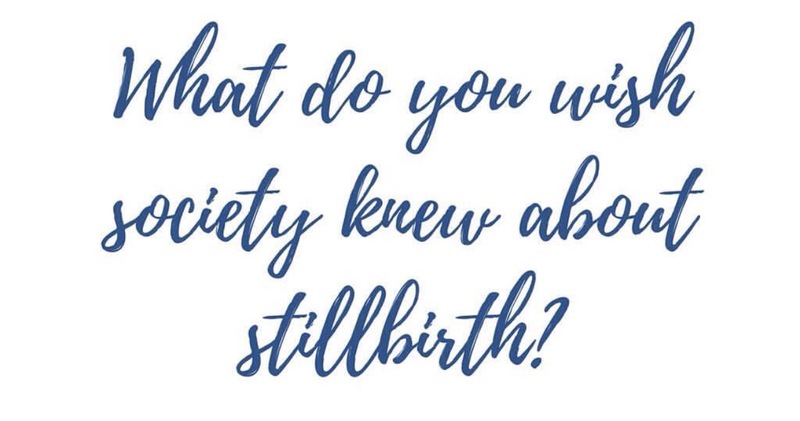 Although I won’t get into intricate detail, I just was involved in a conversation about birth stories that had me biting my lip the whole entire time. I was battling with myself whether to just blurt out how lucky anyone with a living child should feel because it could be so, so much worse. Instead, I kept quiet. Afterwards, I felt ashamed I didn’t stick up for Jensen, myself, and all women who have experienced stillbirth. Stillbirth has changed me into the person I am today. A year and seven months ago, I didn’t know stillbirth still happened. I didn’t think a baby could just die. Nor did I think it could happen to me and my child. When I think about my life, I see it in three different zones: before, during, and after. My pregnancy transformed me into being a mother and not thinking of myself first. Then, when Jensen died, when stillbirth robbed me of my future, I changed again. Grief has morphed me into this person I was so unfamiliar with, at first. I’ve grown into my new self (I fought it for a long time) and although I will never completely accept what has happened to me and my son, I’m thankful for my strength, kindness, and independence I have gained after Jensen was stillborn. I would give it all away to have Jensen back with me, but I will not let his death be seen in a negative aspect. His life has inspired me to be who I am today. There are no reasons why a child should die. Stillbirth taught me that some things are unexplainable. I’ve always been a person who has to see the reason why a certain situation happens, but I never got any answers as to why Jensen died. In fact, most families will never get an answer to why their child was stillborn. That’s absolutely terrifying. It’s sort of difficult to explain how I feel when I have pregnant women ask me what they can do to prevent what happened to me for them. Sometimes I feel like it’s a slap in the face or like I have ‘FAILURE’ tattooed on my forehead. The fact is and what I wish society would take away from any pregnancy or infant loss, not just stillbirth, is there’s really no reason a baby dies or how you can prevent it from happening. Again, another scary statement. During my pregnancy, I did everything my doctors told me to do, I had extra monitoring, and I prayed everyday for his safe arrival. Society makes us believe since they died in their mother’s womb, somehow moms should have this instinct knowledge something is wrong. It shames anyone who has experienced pregnancy and infant loss and it’s completely untrue. A mother who has lost her child didn’t do anything wrong and there is no reason there child isn’t with them. This entry was posted in grieving, Jensen, miscarriage, stillbirth and tagged baby loss, child loss, grief, grief attack, grief journey, grief work, grieving, infant loss, infant loss awareness, Jensen, Jensen Grey, life, life after loss, loss, loss community, love, mama grief, Pregnancy and Infant Loss, Pregnancy and Infant Loss Awareness, Pregnancy Loss Journey, Still Standing, stillbirth, stillbirth awareness, stillborn, Stillborn Still Loved by danielleridgway. Bookmark the permalink. Very well said. I agree with so much written here. My heart aches for all the lost babies. Thank you. It is so heartbreaking to know how many have gone too soon. Beautifully put! I wish so much my Evangeline were here! It’s coming up on 2 months since we lost her at 38 weeks. Though we have a reason FMH it still leaves the question of why? Why does it happen? What did I do? And all the guilt that comes with that. I’m so very sorry for the loss of your sweet Evangeline. There will always be that ‘why?’ You did absolutely everything you could do. Although I know the feeling of guilt, if you could have saved her, you absolutely would. We’re all here for you if you’d like to talk.